Birthdays come at us once a year. We yearn impatiently, in our younger years, for our special day. With our family and friends close at hand, we look forward to celebrating the day we came into this world. The one day where we get all the attention and no one thinks twice about it, because it’s our day. It’s the day where we are entitled to all sorts of privileges. Presents, balloons, games, food, and of course cake await us. We manage to sit through all the conversation from relatives we hardly see, but few times a year. We force down food, just because we know we have to eat something. Tearing apart wrapping paper after wrapping paper, admiring our gifts but secretly only thinking about the best part of the night. The part that comes at the very end, after all the food has been eaten, all the games have been played, and all the presents have been opened. As we get older the impatience soon fades into dread and we can’t seem to get excited anymore. With each passing birthday, it reminds us that we’re getting older. But in the back of our minds, one thing definitely still excites us; cake. They sing to us, in total darkness, with just the gleam of the candles dancing around, illuminating this special scene. We make our wish, the one that truly counts. Blow out the candles, and then with a sigh of relief, as if someone out there in this universe heard our cries, the first slice is made. And just as the knife is about to go in for the second slice, you stop the designated cutter, and say “What, are you afraid it’s going to run out? How about a bigger piece? A little bigger. A little more. There you go.” And as this massive piece of cake is placed in front of you, it slips your mind that you’ve just, not moments ago, devoured a whole meal. And for that one moment in time you forget about everything and everyone. Everything you worry about, goes out the window. Carbs, fats, and calories don’t matter. There’s no place for them in your party. As you eat your slice of cake, your in a euphoric place. A trance. One that is not only delightful but divine. What is it about birthday cakes that make us feel this way? Perhaps its all the attention we get on our birthday. Perhaps its the fact that we’re surrounded by those we love. Maybe its the idea of feeling happy. Whatever it is, you eat your cake slowly and blissfully, wishing, no, hoping that it wont end anytime soon. Good thing we get a whole cake; its alright to have another piece. In fact I encourage it. After all, it’s our birthday, and we could eat more if we want to. It was my soon-to-be-brother-in-law’s birthday and I was faced with a tough dilemma. The man doesn’t like cake. After I found out, fainted, and came to, I started brainstorming. We need to have some sort of something. After all, birthday cake is the main part of celebrating birthdays. 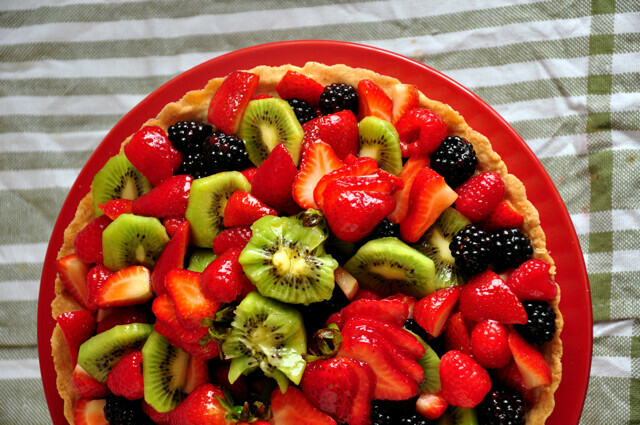 I knew that he loved fruit so I came up with a concept of making a tart. Well with this new concept, all sorts of ideas came to mind. However a new dilemma also arose. Most fresh fruit tarts have a custard in the middle, well, he has a phobia for white creamy things. So a vanilla pastry cream was out of the question. 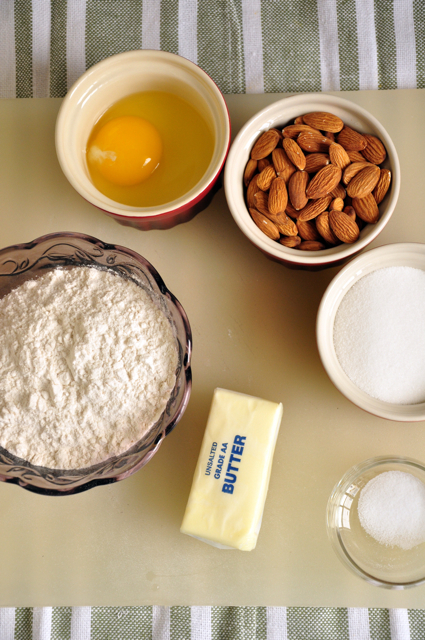 I found a recipe for an almond shortbready type tart. After a few needed alterations I came up with the perfect tart. Just the right centerpiece for a birthday party, with all the bells, whistles, oohs and ahhs, still present. Well, what are we waiting for?